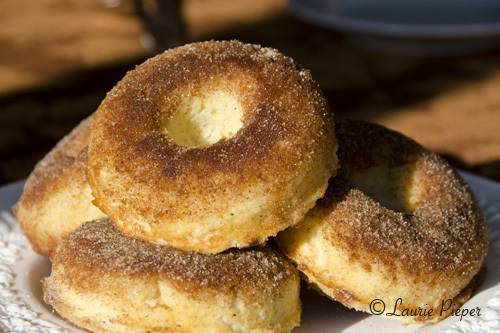 It’s been a while since I’ve posted in my “Let the Inspiration In” series; but I just had to try Frugal Feeding‘s Cinnamon Dipped Doughnuts recipe. Since I am gluten-sensitive, and couldn’t imagine making donuts and not having one, I used white rice flour instead of wheat flour in the recipe. (My batter looked a little thicker than Frugal Feeding’s appears in his photos.) The only other change that I made was that I needed to double the amount of butter used for dipping the donuts. I served these for breakfast this morning – with roasted turkey and fresh tomato omelettes and dishes of fresh berries – and everyone, including me, agreed that they are delicious. Thank you, Frugal Feeding for the recipe! (1) Preheat oven to 425 degrees F. Spray a six-mold donut baking pan with oil. (2) Melt 2 T. of the butter. In a small bowl, beat together butter, eggs, and buttermilk. Set aside. (3) In a medium bowl, whisk together flour, 1/3 c. sugar, baking powder and nutmeg. Whisk in buttermilk mixture until smooth. (4) Divide batter between molds. Bake for 6 to 10 minutes or until they spring back when pressed or until they are firm to the touch (if using rice flour). (I baked my rice flour donuts for 10 minutes.) Let pan cool on a wire rack for a few minutes before turning the donuts out. Meanwhile combine the remaining 3 T. sugar and the cinnamon. (5) Melt the remaining 2 – 4 T. butter. 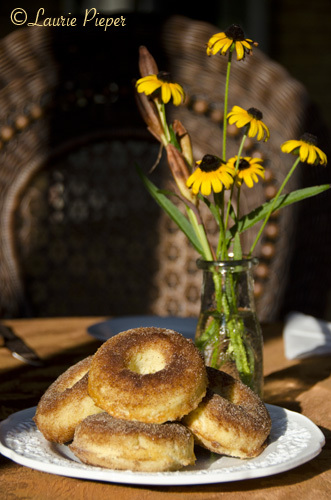 Dip both sides of donuts in melted butter then in cinnamon sugar. Serve right away. This entry was posted in Baked Good & Sweets, I've Been Inspired by ... and tagged Bed & Breakfasts, Breakfasts, Cinnamon, Desserts, Donuts, Gluten-free, Let the Inspiration In Challenge, Photography. Bookmark the permalink. Hmmm I don’t have a donut pan, to be honest I didn’t know one existed! I love the idea of baking instead of frying, besides I don’t own one of those deep fry machines either. I’m wondering if I could just put them in the muffin tin and have them more like a muffin or donut hole shape? 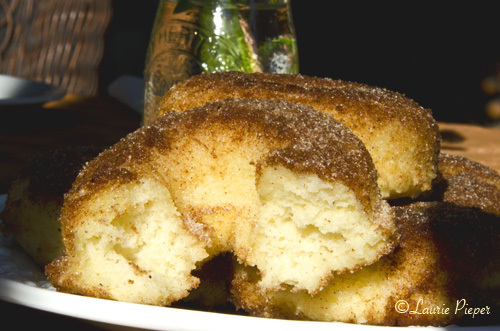 My mom use to make cinnamon and sugar muffins so I imagine these donuts would be tasty! I think that a muffin pan would probably work … or you might experiment with making them like scones. The baked muffin pans work really well though. Whatever you use – enjoy! Thanks for the comment! They are really good! Thanks for the comment! Nothing nicer than a good fresh donut!! If you ever need a new career, you could be a food photographer 🙂 Your pictures are, ahem, good enough to eat! Well, thank you and thank you again for the recipe!